First off, no I am not (yet) compensated by or affiliated with Wendy's "Old Fashioned Hamburgers" restaurant chain. Nor do I live inside one. They're just always spitting hot fire at the fast food game, so to speak. And I have a soft spot--a sweet-tooth for gimmicks (a gimmick-tooth, if you will)--for artificial scarcity marketing, so to speak. I can't help it. It's genetic. It's my raging FOMO. And so here we are today. This might get long. I'm going to add a break (I know! This writing style is so chill and conversational, it's like I'm writing directly to YOU). Hit the jump if you want to find out the top 6 ways this literally unbelievable review will change the way you get your mind blown! I insert my AmericaOnline CD-ROM into the computer's disk drive. The CD spins up and I type the corresponding numbers into the field of the notification box that appears on the screen. That familiar sound--my computer's modem is calling the Internet. I make a note of the time on my notepad (43 minutes left this month). The connection is complete. I open Netscape Navigator via the desktop icon. From the drop-down menu in the toolbar I open the search field and type in my AOL Keyword. A short amount of surfing on the World Wide Web gets me the information I need. I know which Wendy's locations are serving the BlaBeBurger. I log off and make another note of time (31 minutes left this month). BlaBeBurger? BBBurger? BlBnBgr? B:lack-ean-urger? None of these are really speaking to me. I might actually have to write out the whole thing each time. So I roll up to Wendy's drive-thru and I know it's one of their "good" locations because the outdoor menu is all video screen. Except it's kind of hard to see because their "ordering hole" is in a massive pillar like some kind of 2001: A Space Obelisk. It is all-encompassing with regards to field of vision. I think they are designing drive-thrus based on the average American automobile being the size of a Hummer. I want to tell you more about the drive-thru, but my brand-new editor is telling me that it's "too tangential," and "doesn't add to the conversation," and "unnecessarily elongates an already rambling exposition." So, another time, perhaps. 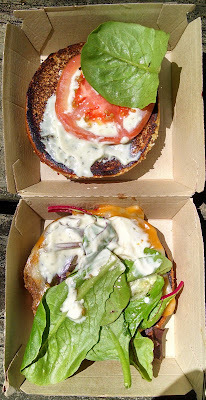 $7.35 is what a medium bleanburger combo will run you these days. The sandwich alone is $4.50. I wanted a small but the way the lady said "will this be a medium or a large?" made it seem like those were the only two options. Plus I was flustered by the crazy menu and unfamiliar drive-thru (see, I told you it would behoove the reader if I were to expound upon the drive-thru experience). Also, I got frenched fries instead of a side salad because a black bean burger is basically a salad and it's a skip day and I deserve it, etc. Would it surprise you if I had a complaint about my iced tea? Because I tasted sweetness in my unsweetened iced tea! Unsweetened is a strange looking word. I'll bet it is troublesome for dyslexics. Do you remember Jodie Sweetin aka Stephanie Tanner from Full House? I drove to one of my favorite nearby parks to enjoy this meatless feast (see: title). It was such a beautiful day, after all. This is great so far. The tea is ice cold. The fries are hot and crispy with an appropriate level of salt. Good fries are important. How many meals have been ruined by soggy floppy over/under salted fries? At least several, for sure. Who would let a thing like that ruin a meal? Someone who cares. That's who. Someone who writes about fast food on a popular web log. 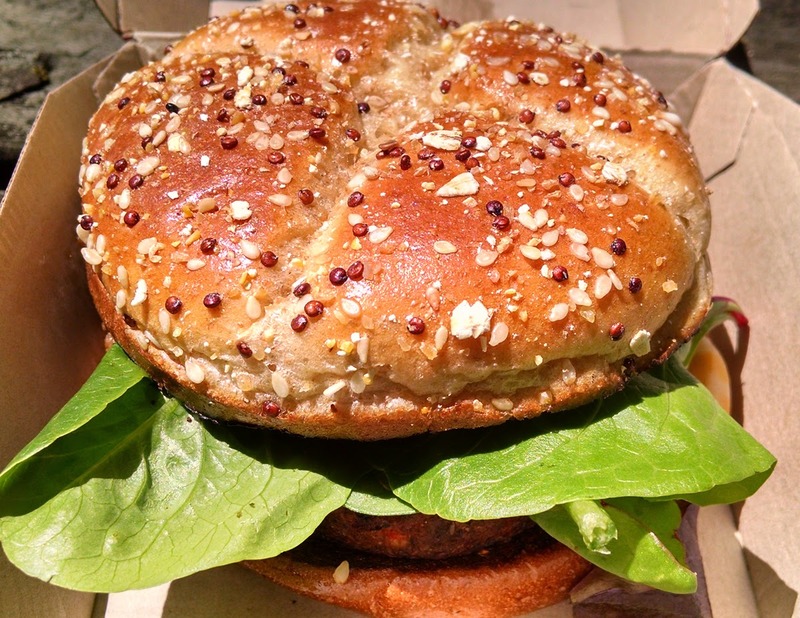 How will this seedy bun compare to the Jalapeno Fresco's terrible bun? And the blabeburger is looking on fleek. It's not all smashed down and misshapen with sauce oozing over onto the bun. You can see the bun covered with several varieties of debris grains, or something. And you can also see some fresh-looking spinach sticking out. Let's open it up. I'm docking my photographer's pay. Watch your shadows, buddy! Okay, the view's not much better inside. There's a "tomato" and you can tell that the bun has been toasted and everything is covered in some type of sauce--presumably ranch-based. Is "ranch" a flavor anyplace in the world other than America? I'm a little bit upset with the spinach distribution. There are probably instructions from corporate to put all the leafy stuff sticking out of the front so that it looks like the burger is totally stacked with copious fresh greens. Can we see the star of the show yet? The patty. Of beans (also peppers and corn). Sure! Actually, not really. It is covered in cheese and the ranch is making everything stick together. In retrospect, flipping it upside-down and snapping a pic creating a photographic image of the undercarriage would have yielded a more enlightening perspective of the goods. But I wasn't thinking about that. I was too pumped to get this into my mouth. Is looking at a picture of a half-eaten sandwich interesting to anyone? Anybody at all? So there you can see the strata of the blackeanurger. Pretty straightforward sandwich. Time for the breakdown. I can't find any nutritional or ingredient information on this sandwich, so I'll be guessing on all ingredients. Let's talk taste! Bun: bun bun bun bun. Obviously wholesome in appearance with all of the grains. I love multi-grained bread. I see: sesame seeds, cracked oats, and I don't know what those little dark balls are. Some type of seed. Maybe mustard seeds. Any grain experts in the crowd want to chime in? Anyways, despite all of the grains on the lid, the bun is otherwise white bread. There's a sweetness to it and it has definitely been heavily buttered. Not just for toasting, I think. Look back and see how much even the outside of the bun glistens. It's good bread. Very appropriate for this sandwich. It's easy to chew and not too heavy, but not too insubstantial either. Veggies: A single tomato slice and about 5 leaves of spinach. I've just been calling it spinach. It looks like there might be some other stuff in there. Arugula or whatever--I dunno, I'm not a farmer or a rabbit. I know that other Wendy's sandwiches have tender greens that appear to be from one of those "mixed greens" plastic tubs you can get at the grocery store. The greens are good. The tomato is one of those hard pink flavorless tomatoes. It adds moisture and texture, but I'm missing the flavor. Sauce: (Prounounced "sssOoowwwwzzz") It's Wendy's Asiago Ranch Sauce. Creamy, ranchy, thick and sticky. Closer to mayo than dressing. Cheese: It's my understanding that this is the same Colby-Pepperjack that appears on the Jalapeño Fresco burger. So, mild and not too "jacky" but real cheese nonetheless. Sure beats a Kraft Single. Black Bean Patty: Finally! It's made from black beans, corn, red/yellow peppers, maybe some rice, other additives, spices. We'll know for sure once this goes national and Wendy's posts an ingredients list on their website. Look at this thing. The patty is 1/4 to 3/8 inches thick. That's what you would expect for fast food, but I like those big bulging hulking patties. I'm not sure what I expected, but looking at the blaberger for the first time kind of let the air out of my balloons, as they say. It tastes good. There is a nice level of spice--a flavor spice, not a heat spice. It is fibrous in texture with a few crunches. That combined texture is very good. Black bean burgers in general tend to be dry. They need to be or they would fall apart. The ranch sauce and buttery bun definitely help out here. As do the vegetables. I may have had some issues with some of the ingredients individually, but as a whole this is definitely a very cohesive sandwich. This will no doubt be expanding to other Wendy's in the near future. If I were a vegetarian upset with lunch options, this sandwich would have me very excited. Do you know what I thought as I was eating it? One, I wondered what it would taste like with just the patty, a slice of cheese, and one of their cheap buns. No but for real, I thought "this would be good on a real hamburger." 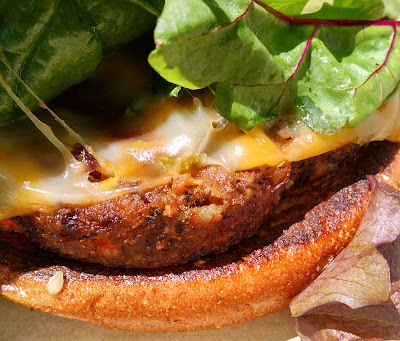 Like, take the same black bean burger, but also add in a regular hamburger patty. And maybe some bacon. That would be tops, man. Also of note: the patty is ROUND! 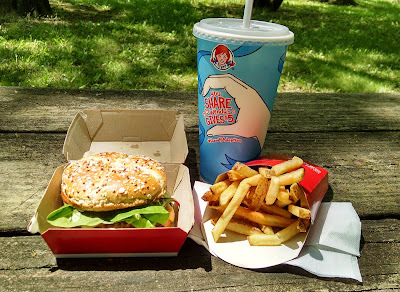 Wendy's is known for its square hamburger patties. Was this an oversight? Or a way of differentiating the sandwich? Or they're all "Dave Thomas is dead, hell, let's do whatever we want now!" 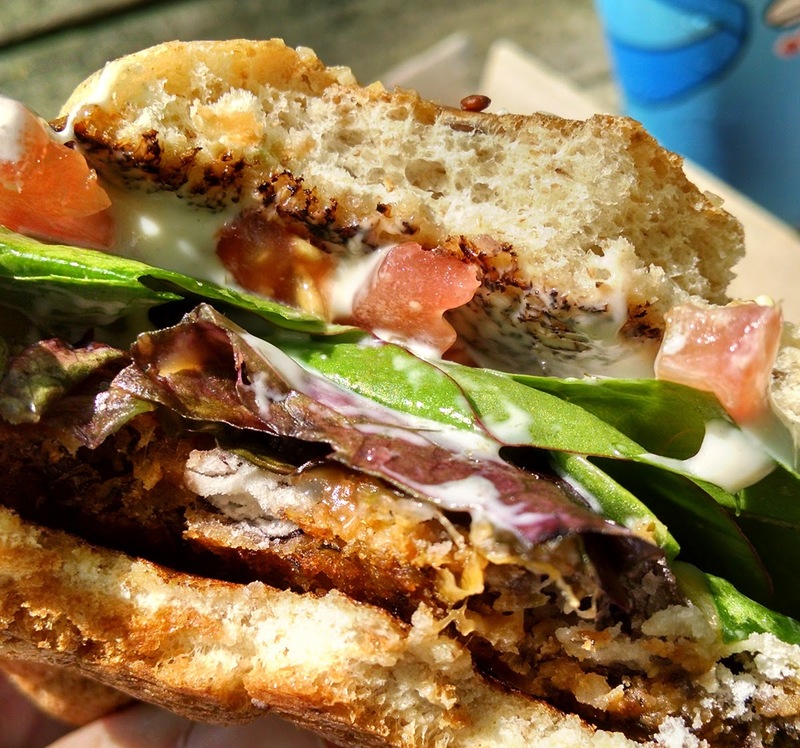 Conclusion: Strong entry into the vegetarian sandwich field. Tasty patty with good accessories. A little too expensive. For now, getting one is an inconvenience because you have to go to a special Wendy's. I look forward to the day that I can order a Baconator with black bean patties at any Wendy's in America.